Every now and then, staff members at Boomerful.com and their friends end the work-week by opening a couple bottles of wine and sharing their thoughts and impressions. Here is what we had to say about two bottles we had never tried before. This California wine brought a smile to everyone's face with its sassy label. But would the contents live up to its trendy attitude? Theresa: This smells good and it doesn't burn. It's smooth. I would buy it. Melissa: It's tart but light. Michele: I find it wanting. It has a Hi-C fruit punch tone to it. Mark: There's a little taste of cinnamon to it. Nancy: Kind of thin, not much character – but certainly drinkable. In general, we all agreed it was affordable (regular price $9.99 a bottle) and drinkable: a fun wine that might not impress the wine-snobs among your friends, but certainly the label would make for fun conversation at a gathering. 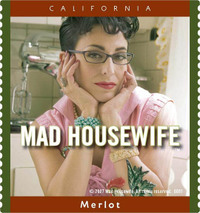 While there was nothing wrong with Mad Housewife, this flavorful South African wine won greater approval among the day's wine-tasters. Mark: It has a black cherry thing going for it. It's tart and tangy, with a hint of bitter cocoa. Theresa: I liked the first sip quite a lot. I'm getting fruit. I would call this a fruit-forward wine. Michele: Anise ... I'm tasting anise. Melissa: It's pretty smooth for a cabernet blend. I'm tasting sour cherry. 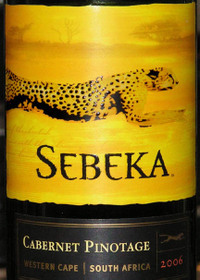 In general, we all enjoyed this rich and affordable (regular price $8.99 a bottle) offering from Sebeka, and were also amused by the animal print cork! If you have a friend who collects cork, this would make a noteworthy gift. Do you have a favorite wine you'd like to tell us about? The Burning Question: Are Your Parents and/or Children Living with You? For most families, children leave home after they reach a certain age. But, for various reasons, there are times when adult children need to return to live in the home where they grew up. And, there are circumstances when it becomes necessary to take in one's parents - especially if they are having health problems. Are your adult children or your parents (or both!) living with you? Tell us how that is working out for your family. Assistant Editor Mark McLaughlin weighs the merits of a high-tech, multifunctional scale. The Tanita InnerScan Body Composition Monitor is certainly the most stylish scale I've ever used. It would be an attractive addition to most bathrooms - with its sleek lines and stainless steel finish, it looks like a piece of modern art. 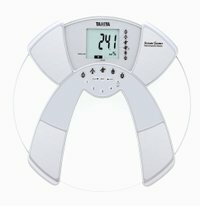 This high-tech monitor gives you your weight, muscle mass, bone mass, percentage of body fat and more. My only complaint (a very small one) is that the controls are rather complex, and it took me about ten minutes to program it before I could even weigh myself for the first time. Fortunately, the machine had a function for saving my settings, so I don't have to reprogram it every time I use it. Now I use the Body Composition Monitor regularly and I find it extremely helpful. Since I started using it, I've been cutting more and more fat out of my diet, so I can lower my body fat percentage. As a result, my body fat has dropped two percent. I would recommend the Body Composition Monitor to anyone who seriously wants to keep an eye on their weight, body fat, and other body composition statistics. Bear in mind, this equipment is for home use only and is not intended to replace professional healthcare services. It is not intended to diagnose or treat any diseases, so you should use this equipment in conjunction with advice from your personal physician. Find out more at this website. Contributing Editor Melina Papadakis reports on an important medical breakthrough. For those suffering from diabetes, there may be help in the future, thanks to the work of Dr. Marc Rose, president and co-founder of VitalCare – www.vitalcaretechnology.com. Dr. Rose may have developed a potential cure for diabetes. Most people think of diabetes as a blood sugar problem, but that is just a symptom of the disease. Diabetes is caused by a malfunctioning metabolism. No matter how carefully a type 1 (juvenile onset) or type 2 (adult onset) person with diabetes monitors blood sugar or measures insulin, he or she is still fighting a ticking clock. Nearly all people with diabetes will eventually have complications like kidney or heart failure. VitalCare clinics use iCAT Therapy to give patients micro-pulses of insulin, mimicking the way food and energy are processed in the normal human body. Dr. Rose says that over time, the treatment stops, stabilizes and actually manages to fix damage from diabetes. To date, no negative side effects have been reported. The FDA-approved, once-a-week, six-hour treatment costs one-thousand dollars. That may sound like a lot, but compared to a lifetime of medical complications this actually saves HMO's, PPO's, hospitals and taxpayers' money. "If we can cut hospitalizations for diabetes by just 50 percent - and we can - that will save millions of dollars a year," said Dr. Rose. Rose has 30 VitalCare clinics throughout the country, but foresees more. Has diabetes affected you or someone in your family? Tell us about how you've dealt with this serious health concern. Contributing Editor Melina Papadakis shares some seasonal footwear advice. With the temperatures rising, fashionistas are kicking off their heels and slipping on comfortable and airy gladiator sandals and decorative flip flops. Unfortunately, while they may feel they're giving their feet a rest, New York City podiatrist Dr. Oliver Zong warns that flip flops and flats may do more harm than good. According to Dr. Zong, "Instead of mimicking the movement of walking barefoot and allowing the foot to naturally roll from heel to toe, a soft-soled shoe actually creates more work for the muscles of the foot therefore tiring them out faster." During the summer, Dr. Zong often sees patients with symptoms of heel pain, plantar fasciitis, or tendonitis. In fact, a new study published by Auburn University has found that flip flop wearers took shorter steps and their heels hit the ground with less vertical force than when the same walkers wore athletic shoes. "A soft-soled shoe generally does not allow the foot to naturally roll from heel to toe," said Dr. Zong, "since it generally has a softer midfoot - and the lack of support will generally cause more injury then good." The study also found that people wearing flip flops don't raise their toes up as much as the legs swing forward to take a step. Dr Zong says that soft-soled shoes call for more gripping of the toes during the gait cycle, and it can cause overuse of the tendons and lead to injury. To remedy these problems, he recommends patients return to support shoes such as sneakers with a sturdy sole and heel. In the long run, Dr. Zong recommends limiting flip flop use to a few hours a day - and the same goes for women wearing high heels. What kind of shoes do you wear? Do you ever sacrifice comfort for fashion? Let us know! Germs are probably the last things that come to mind when thinking about your makeup brushes. But if brushes are not cared for properly, they can become magnets for bacteria that will lead to poor makeup application and irritated skin. Caring for your brushes will save you time, money - and your face. Shana King, a professional makeup artist and founder of adesign Brushes - www.adesignbrushes.com - recommends these easy tips to clean, maintain and store your favorite beauty tools. Storage: Store brushes in their custom pouches to assure that the bristles will not be crushed. Cleaning: Once a month, use mild soap or shampoo and water. Gently work soap or shampoo through the bristles. Swirl the brush in circles in the palm of your hand and rinse under water, until the water is clear. Drying: If possible, hang up the brushes, bristles downward, so they can drip-dry. Quick Cleanings: As needed, use an alcohol-free swab to remove access makeup in between big washes. Just follow these tips to keep your brushes germ-free and in top condition. Do you have any personal beauty tips that you'd like to share with your friends here at Boomerful.com? New Product Editor Mary Kellenberger shares some very special memories. That's what we were all singing as we walked out of church proudly behind my Mother's casket - just one year ago. My Mother was the most beautiful, loving woman of grace I've ever known. I not only say that as her daughter - but these words were expressed time and again by others at her wake, funeral Mass and at the Irish celebration of life that followed her funeral. I was so privileged to have had her - not only as a Mother but as a best friend. I often think how lucky I was to have enjoyed her comforting friendship into my senior years. So many of my friends lost their parents early in their lives. I can remember praying desperately when a good friend lost her mother in high school - "Please, please God. Just let my Mother live until I get married." Then – "Please, please God. Just let my Mother live to hold my children." Then – "Please, please God. Just let my Mother live to hold my grandchildren." It was always a prayer to not take her away. Even when she was into her last few days in the hospice - "Please, please God. Don’t let her die...." - when I should have been praying - "Please, please God - take her home to be with you and Dad and all her siblings and friends, so she doesn’t have to suffer anymore." In the very end, that was my prayer - but it was a hard one to say. Whether or not people believe in a God, losing our Mothers is one of the most difficult parts of life. Having a God - and a faith that there is a reward and meeting place after we die - just made it so much easier for me. But, that's a very personal thing. It was equally difficult to lose my Dad - but different. One of the simple joys of having her in my life for so long, was that I could finally understand what she meant when she'd talk about getting up to go to the bathroom so often during the night; or the snapping sound her knees made sometimes when she walked down the stairs or would get up from her favorite chair. We came to share many of the senior symptoms as she got older - as did I. There's something very special about being a woman and sharing these things with your Mother. She understands, empathizes, sympathizes but never criticizes. And, no one will ever love you as much. If you're reading this - thank you. I want people to know about this incredible Woman. But - it might be a bore - after all, most of us love our Moms this dearly. However, for me writing it is cathartic, so I'm really being just plain selfish. Thanks for putting up with a little bit of my heart healing.